SSC JE Cut Off 2019: The Staff Selection Commission (SSC) Junior Engineer Paper -I cut off is expected to be out soon. Candidates who appeared for the examination, they will be informed regarding the SSC JE Tier I Cut Off 2019 marks through an intimation, which the candidates will receive on their registered mobile number. The tier I examinations is successfully over. Further essential details such as SSC JE Gen EWS ONC SC ST Cutoff Marks 2019 previous year cut off, and steps to download the tier I cut off are given in the below section. Latest Update: SSC will soon release the Junior Engineer Gen EWS OBC SC ST Cutoff Marks 2019. Aspirants can check expected & category wise cutoff marks from here. (एसएससी जूनियर इंजीनियर कटऑफ अंक): The SSC Junior Engineer exam paper I and paper II cut off will be drawn from 500 marks. Candidates who will clear the SSC JE Civil Cut off 2019 Tier 1 with respective of category wise (Gen, ESW, OBC, SC, ST) they will be shortlisted for Tier II examination. The Cut-off of tier-I will be framed out of 200 marks whereas the cut of tier II will be framed from 300 marks. The final Merit will be drawn on the basis of tier I and tierII examination. Aspirants who are seeking for the cut-off and scorecard they can check their maks as per below-provided steps. Take a printout of it for further reference. The SSC JE descriptive paper (tier 2) cut-off will be revealed along with the scorecard. 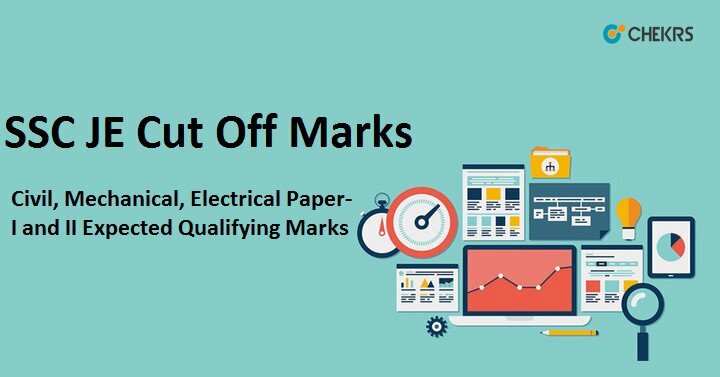 Candidates who appeared for the examination their SSC Junior Engineer Electrical Cut-Off marks will be revealed on the official website of SSC. Generally, the unreserved category candidates cut off used to bit high as compared to reserved category candidates (OBC/SC/ST/PWD). Candidates will be called for interview and other rounds of selection on the basis of SSC JE Qualifying Marks. As the moment the competitive examination gets over, the next thing that strikes the aspirants minds is cut-off criteria. Candidates who are predicting the cut-off, to make you more reliable regarding the SSC JE Mechanical Cut Off 2019, here we have compiled an expected cut-off. Go through the tabular information and check the cut-off. you can collect the more government jobs results, and cut off marks from our website www.jobs.chekrs.com. If you have any query about SSC JE Cut Off 2019 that you can write comments on the commenting box and take a review or feedback.